It’s nice to see we hams, who I think suffer from a bit of an image as throwbacks in the larger maker community, get some recognition for the good stuff we’ve accomplished. 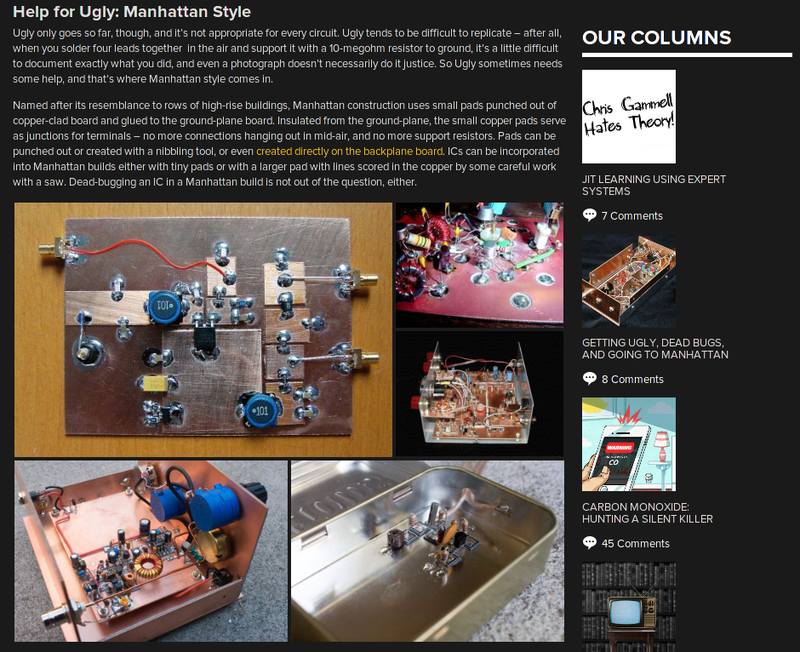 Today on Hackaday, a nice article about Manhattan and Ugly construction was posted, with ample coverage given to the fact that a lot of the best exemplars of these techniques come from the world of amateur radio builders. I’m not certain about how others feel on this topic, but it seems to me that Hackaday is one of the preeminent blogs relating to our hobby, so I get quite excited when we get repped there. Featured in this article are two names well-known in our circles, and guys that I’m proud to call my friends (although I have never personally met either in real life yet!). Todd VE7BPO, is renowned for his rigorous empirical work in circuit design, as well as his beautiful Ugly circuit creations. They feature one of his designs near the top of the article. The other is Dave AA7EE, who is probably familiar to almost every reader, unless you just crawled out from living under a rock for the last decade. It’s not difficult to see why they chose Dave’s work for to illustrate Manhattan construction, as his is some of the best out there. Period. 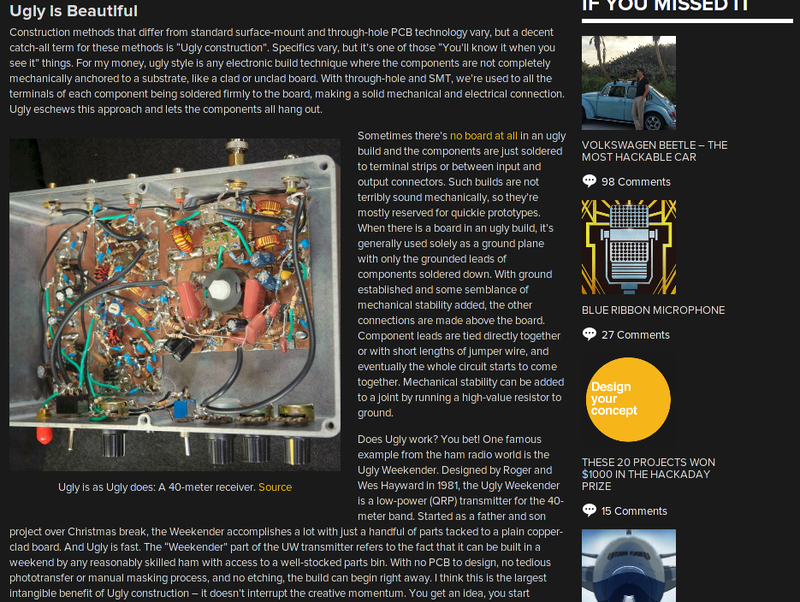 Also unsurprisingly, this is not the first time that Dave’s creations have made it to Hackaday. Well done, gentlemen! Way to show the maker world at large that we’ve got relevant skills for the 21st century hacker community! It’s an honor to be featured alongside Todd. His work embodies the ham spirit perfectly. IMHO, Todd’s endeavors are what the world of ham radio and home-brewing are all about. PS – I think it’s very fitting that the picture at the top is of K8IQY’s version of the SW30+ transceiver. I understand that one year, when Jim submitted a project to the FDIM building contest, Chuck K7QO saw his project and coined the term “Manhattan construction” to describe his method. I remember seeing his beautiful creations and thinking that if my construction could be almost as good as his, I’d be well happy. I think I got halfway there, and that’s good enough for me. He’s the king of Manhattan construction. I couldn’t agree more about K8IQY. He certainly deserves recognition as the one to popularize this technique.